A three part article, originally written for the Large Format Examiner, discussing the past, present and future of Giant Domes. Digital domes. They’re complicated. I’ve spent many, many hours in domes: watching them, enjoying them, cursing them, shaking my head in frustration at them, and, more than once, shedding a little tear in them (in a good way). I’ve been asked by LF Examiner to put together my own perspective on the subject. In particular to look forward, from a technical perspective, to the future of domes and how emerging technologies, such as laser illumination, will make the world, or at least the world of domes, a better place. This is a subject very close to my heart. And soul. So with the editor’s encouragement, I have decided to go all-in and share my thoughts and experiences and a few facts about the future of domes. It’s a big subject, and to make it easier to digest, it’s being presented in three parts: the Past (in this issue), the Present, and the Future (in the next two issues). If you’re in the market for a new digital system, don’t look for any answers in this first part, the Past. It doesn’t provide any (they’ll come later). It’s here to put the challenge of digital domes — for operators, producers, vendors, marketeers, et al — into perspective. To move forward we’re going to have to overcome certain stigmas around digital domes, most of which we’ve created ourselves in our infectious enthusiasm to make this medium work. And my best dome moment, at Chicago’s Adler Planetarium, standing in the middle of the cosmos watching two galaxies collide. I felt like Dr. Who, watching the universe perform a ballet of the stars from the safety of my own TARDIS. It felt real, really real. Wow-some real. I felt that I should be holding my breath because I was in space. That real. 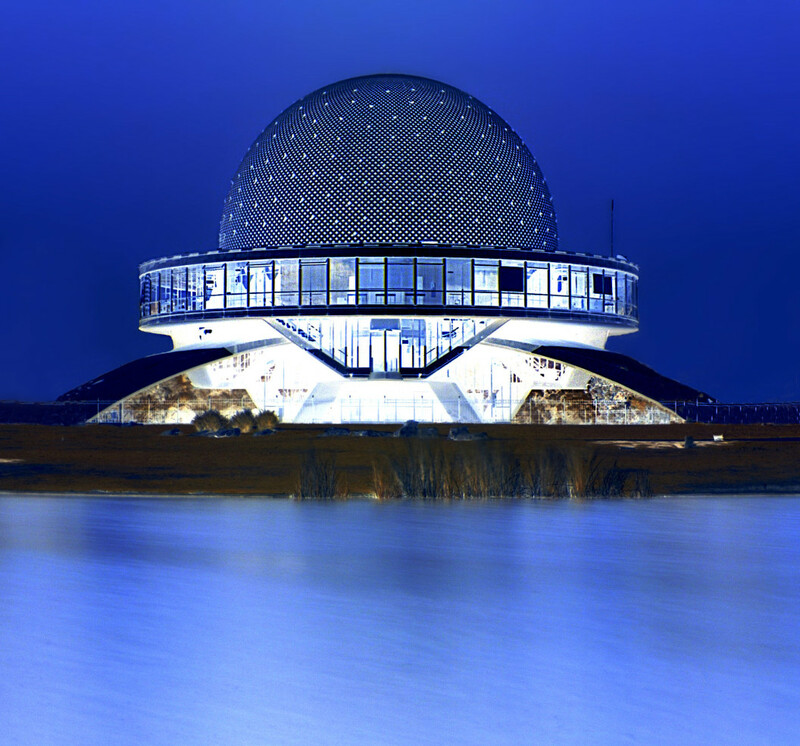 The Adler Planetarium, for those of you not familiar with it, is probably the only true 8K dome ever built (at least for public presentations). Each pixel is only 1.3 arc minutes across, very nearly equivalent to 20/20 vision resolution. It uses 20 super-duper high-contrast projectors called Zorro which can display a true sequential contrast of 1,000,000:1. That means it can project black. (It doesn’t actually project black of course, it projects nothing for the black bits, but you know what I mean.) This unique combination of very high resolution, very high contrast, and the shape of the dome means that most of the time you can’t see the screen. Or at least can’t determine where the screen is, and therefore it simply disappears. Move the content around a bit (ideally with two axis of motion) and that’s it: 3D for free. Without the glasses. Well, not free exactly: all-in they spent about $5 million on the technology and the very seamless Spitz screen. It is a truly unforgettable experience, though. In a very good way. A wow-some way. I’ve had many other unforgettable experiences in a dome. Sadly, many of them not so good. Hours and hours of them, in fact. Some just looking at dots. Alignment dots. “Back at bit, one more, no the other way.” That was how we aligned a dome back in the day. One person in the theater with tired eyes staring at the screen, the other at the console, clicking the keyboard. Hours and hours and hours in a dome looking at test patterns. Also fine colored lines. Then an all-white screen, then green, then red, then blue. “That’s it, save it, let’s get back to the hotel,” often as the sun was rising. Next evening (yes, the client wanted to run shows during the day), “what’s happened, what’s moved?” The fact is, it all moved. The dome moves! Yes, it does, just an inch or so as it expands and contracts due to temperature variations with people and air-conditioning. And the signal changes. Those precise alignments carried out the night before were sent via old-fashioned analogue signals. Which change, slightly. But most of all, the big culprits were the lamps (or CRT’s if you’re old enough). Red and yellow and pink and green, orange and purple and blue. Often a combination of those, but never the same, day to day. What we were after was white. (In fact, normally a greenish white. It’s a brighter white because our eyes are more sensitive to green.) And that was for just one projector. We needed to use a few of them. Six was, and still is, a common number of projectors needed to achieve sufficient resolution and brightness for a large dome. If projector number one was behaving itself, you could be certain that one of the five others wasn’t. To make matters worse, we humans are really sensitive to color difference, in particular when two colors are side by side. Certainly not. It’s a very complicated subject, in fact. One way of measuring color is to use Delta-E’s. Delta what’s? No, not a trippy substance, but simply the metric used to describe the differences (the ‘distance’) between two colors. Typically, the human eye can just perceive the difference of one Delta-E. The very best reference monitors used today (for digital publishing for instance) can be calibrated to achieve one Delta-E or even less. Trust me, that’s impressive. A Delta-E of two is good, but four isn’t. No such luxury in domes. If the color if off by a Delta-E or a bit, you’ll spot it. Simply because there’s an image from another projector or two right next to it to compare. It’s not obvious all the time, though. It depends on the content. A cloudless pale blue sky? Yes, that will do it. Skin tones across two projectors” Uh huh. Mars. Yep, always Mars. Something about that tone of orange always does it. If you want to test a digital dome system, go to Mars (digitally of course, there’s plenty of content out there). If Mars and the pale blue sky looked good, you knew you had a great system with perfectly adjusted color matching. So it was difficult, way back then, when digital wasn’t fully digital. To align a dome so that it looked great was tough. It needed the most skillful people, the dome artisans. Often they were requested by name to come and align the dome. And when they did, it was great. How far back am I talking about? Decades perhaps? Er, no. Less than ten years. I came from a company called SEOS. Experts in flight simulation technology, we expanded our expertise into domes because we thought we could do better. And we did, often. As soon as the technology was capable, we went fully digital. That meant replacing all the analogue bits with the latest digital bits. Which meant we could control the all of the bits (and bytes) very precisely. If we wanted to send the same color value of red to all projectors, we could. And it stayed that value, forever. This made a big difference. Digital DLP projectors were also getting better, and more stable. No longer did we need to visit the projector factory to dismantle the projectors and hand-pick the components, to normalize as many variables as possible. We just checked the “color matched” box from the options list on the order form and the nice people at the factory did all that hard work for us. But these processes just improved the breed, and digital domes slowly got better, and stayed better, more often. Return to a perfectly aligned dome a few weeks later, though, and of course it looked different. Simply because the lamps aged. And as they aged they changed in a fairly unpredictable way, not just getting dimmer. One would go a little reddish, another greenish. So after all that effort, your seamless display wasn’t so seamless anymore. The worse ones, the ones that didn’t have all that preparation, and care, and attention to detail, and expense, looked bad right out of the box. A box of Smarties (the original British version of M&M’s), in fact. And that’s what people called them. The stigma of digital domes. They looked like a box of Smarties (but often less colorful because of the lack of contrast, which we’ll cover later). Recently, there have been two important technological advances for dome projection. The first is high-powered 4K projectors, which offer a good solution for domes, though not in all circumstances. It only takes two of these big machines to create a 4K dome (2.7 arc minutes per pixel), one pointing toward the front of the dome, the other the rear. This simply reduces the variables. However, progress, being what it is, didn’t stand still, and some bright spark had the idea of putting six big 4K projectors where six little ones used to go. Wow, more light, more resolution. Just over 6k of resolution, in fact (or “8K” if you’re in the marketing department). And more colors, all different again. And less contrast (about which more later). Progress? Really? And the cost of lamps. And support. And spares. Two steps forward…. As for color calibration, the judges are out (at least this one is), but it is definitely possible and at least one vendor, Evans & Sutherland, has installed one in Richmond, VA. So let’s see. I’m hopeful. Getting auto-color right, and accurate enough (especially in the blend regions) is a major hurdle in resolving the problems with multichannel projection. planetarium market. Dark-sky (i.e., very dark scene) content is of great importance to this group, along with full coverage of the dome surface: a 165- to 180-degree vertical field of view. Compare this to 15/70 film-based domes. These are typically larger domes, showing live, bright content which typically covers more than half of the dome, about a 125- degree vertical field of view. What you want to show will determine what your system needs to be able to do: 3D, fulldome, high-brightness, black-blackness? All of the above? A good place to start is to compare multichannel vs. single-channel systems. Single-channel means that one projector will cover the entire image area. It can also mean that a pair of projectors will cover the same area, one stacked on top of the other, typically for reasons of brightness. It’s the approach Imax Corporation is using for their laser powered digital dome system, which I’ll explain, as best I can, in the second part of this series. Multichannel means that one projector covers only a fraction of the entire image. Multichannel requires blending the images from the projectors in the overlap area, either digitally, or optically if dark scenes are required. It also requires color matching. Projectors can be paired up (double stacked) on multichannel systems, typically for 3D capability. Looking forward, wouldn’t it be nice if there was a light source that could be digitally controlled, accurately and automatically. Even calibrated to within one Delta-E? You’re ahead of me, aren’t you? Yep, lasers! I can’t wait…. The disadvantages of multichannel are obvious. Simply put: calibration and stability. The main advantage is significant, too. Higher resolution. Much higher resolution, in fact. Not just by using more projectors, but also by using more lenses. More lenses means that each lens needs to do less work: each one only covers a portion of the entire resolution of the image. Multichannel will achieve the resolution of 15/70 film. Probably better. Also stability, for the digital part of the system, has been resolved now, as has calibration. If it weren’t for those damn lamps…. Conversely, a single-channel system is less complex. But complexity is relative: an iPhone is a very complex device but its technology has made it seem simple. Similarly in domes, technology will make the systems appear increasingly simple. Eventually, the number of projectors will not be the determining factor for the reliability of the system. Other things will be. And reliability and consistency will cease to be the prime consideration, because all systems will be reliable and consistent. The disadvantage to single-channel systems is resolution. It’s limited, in a dome, to the vertical resolution of the projector. That’s 2160 pixels for a 4K projector. So the question for a single-channel system is, how much dome should be covered by 2160 pixels? At 125 degrees (the same coverage as 15/70 film), 2160 pixels yield a pixel size of 3.5 arc minutes. Which is okay, but it’s hardly ground-breaking. Reduce the vertical field of view to 90 degrees and you get 2.5 arc minute-sized pixels, about equivalent to a 4K dome. At that vertical field of view it becomes a “dome insert” projection system, where the image becomes rectangular (or as much as it can be on a dome). This is significant, because there’s a lot of rectilinear content out there, available as DCPs, the digital file distribution format for Hollywood films. Life gets really easy now. Same for 3D. Good resolution, lots of content, 2D and 3D. But it’s not really “dome,” is it? The only thing that makes it “dome” is that it’s played in a dome. Is dome insert the future? I doubt it. So why not wait for 8K projectors? These will have 4K resolution vertically, with just one projector. Yes they will…. This is the second part of a three part article about the future of digital domes, particularly for the giant-screen market, where digital projection systems are slowly creeping up on, and are about to devour, film systems. The first part described the past and how we got here: approaching the end of 2014 with one or two digital installations using a brace of projectors to deliver the brightness and resolution required to stand confidently alongside film. Part 1 left us wondering, though. If we just wait a little for an 8K projector to come along, then we can simply install one at the back of the theater to deliver around 8K pixels across and 4K pixels stretched slightly front to back, to cover enough of the screen. One projector, a special fisheye-ish lens, and one big server with built-in encryption. There, that would do it. That’s probably the best decision. Just wait. Lowest risk, best possible outcome. By waiting, the technology will get better and cheaper. That’s the way it works, right? But how long should we wait and how long can we wait. A year? Two? Five? Well, how long we can wait will depend upon a few things; supplier contracts, the availability of film stock, and the supply of films available on film (rather than digital-only). And the market. If others are going digital, they will probably do other things in their dome that film can’t. Don’t want to be left behind. Then how long should we wait? Well, until this new 8K projector comes along; it should be right around the corner, shouldn’t it? I’m sure I read that someone had an 8K flat panel about to launch soon, the end of this year? Or was it next year? Anyway, soon. Then there’s all those 8K cameras around. My phone’s got an 8K camera, and that’s the low res front facing one. 8K’s coming, it’s probably a year away. Isn’t it? I don’t mean to pour cold water on this utopian, just-around-the-corner view of the world, but I suspect it might take a while. Let me explain. Eight-K is complicated. At least four times more complicated than 4K (that’s how many more pixels there are). And I say “at least” because, at this resolution, the optical pixels (the bits that actually modulate the light to create the pixels that you see), get really, really small, and the digital pixels (all of the image processing electronics to receive the image data from a server and control the optical pixels so that everything looks as it should), need to work really, really fast. The most complicated part of an 8K projector would be “the chip,” as it’s typically called. This is the device that would contain all of those optical pixels. Approximately 34 million of them. Over the years a few chip technologies have come and gone. The two leading contenders today are liquid crystal on silicon (LCoS) and digital light processor (DLP). Think of LCoS as a sandwich. Because it is. It spreads a very thin layer of liquid crystals upon a slice of electronic toast containing individual electronic pixels which are covered with a mirror surface. These electronic pixels send a charge through the liquid crystal which changes how the liquid crystal reflects polarized light at that specific point. The top layer of the sandwich is the cover glass and some light polarizers. The polarized light, a lot of it, gets focused on the chip, through the liquid crystal onto the mirror, and back out again. Where that light goes depends upon the digital pixels at the bottom. Good pixels, the one we want on the screen, are aligned by the liquid crystal and sent out through a polarizer and off to the lens; naughty ones don’t, and go into the naughty bin, a torrid, dark space designed to absorb light. The better it is at doing that, the better the contrast. Because the pixels are all digital, it’s relatively easy (compared to DLP for example) to make them smaller and to make more of them. Which bodes well for 8K. However because all the light has to go through the device, and back out again, it’s very sensitive to higher light energy. That’s why we don’t see very high brightness LCoS projectors. Twenty thousand lumens is about the limit today, which becomes about 16,000 by the time you’ve got it to the color of white you want and the lamp has been on for a day or so. In contrast, the latest DLP based laser-powered projectors are putting out as much as 70,000 lumens. So one could imagine an 8K LCoS-based projector (in fact, prototypes exit), but not with the 80,000 lumens or so needed to light up a big dome. Not looking likely anytime soon. Even the slightly cooler laser lumens get pretty hot. Ask Imax Corporation, that’s their justification for the overlapping-image technique they’re using with their DLP based laser-illuminated projector. Hot things move microscopically, so they’re impossible to align. They say. DLP’s use digital micro-mirror device (DMD) chips, which are almost the complete opposite of LCoS chips. They are an invention of Texas Instruments and were first developed into a projector by Rank-Brymar of Great Britain. Their first prototype was demonstrated in 1995. I was there. And like the rest of the audience I almost laughed out loud when they tried to convince us that they were using a chip with mirrors on top. Each mirror, an optical pixel mounted by two corners onto miniature posts with tiny springs, would wiggle really fast to reflect light. The more time it stayed tipped to one side, the more light would be reflected into the lens toward the screen. The more it stayed tipped over to the other side, the more the light of that pixel would go into the DLP version of the naughty bin. What was most amazing was that each of these pixels was tiny, only 10 micrometers or so across. What happens when the springs break? Won’t they fall off? Won’t they get stuck? What about the gaps between the pixels, won’t we see those on the screen? The questions were obvious and unanimous. As was the skepticism. Except from one group: Texas Instruments. They though it was a great use of their DMD chips. So they eventually developed the projector market by making complete DLP engines to sell to projector manufacturers. And over the years they turned it into the most successful technology for projectors. Yes, in the early days some mirrors fell off (albeit very few). More often some got stuck. But no more. DLP is probably the most robust technology of this genre; it loves light. Lots of it. Because the light is bounced off the surface, DLP is quite happy being bombarded with tens of thousands of lumens. Just what we need for a giant dome, especially if we’re going to fill the entire screen area with it. But it’s really difficult to make these moving mirrors much smaller. They’re already very small. Can it be done? Only TI knows. But it took them a long time to go from 2k to 4K. Can they make bigger chips rather than making the mirrors smaller, maybe just for the 8K market, or even just the giant-screen market? Unlikely. TI has always been about volume. Tens of thousands or hundreds of thousands, yes. But not for 200 chips. (Okay, 600; each projector needs three, one each for red, green, and blue). What about 8K for multiplexes? That’s 300,000 chips right there. The problem is, I don’t hear any theater chains crying out for 8K right now. Do you? So we’re on our own? Yes, I think we are for a while. No one, I fear, can make, or is motivated to make, an 8K chip suitable for single- projector giant domes anytime soon. When? I honestly don’t know. But to give you a barometer, in 2008 I was doing some work for a very famous theme park company to develop a multi-projector, laser-illuminated dome system. I told them that 2012 will be the “year of the laser.” It was “about four years away,” I confidently predicted, based on prototypes that were already being shown. So how wrong was I? About 50% wrong. Only now, six years later, are we seeing the very first laser projector shipments. So 8K chips? I’ll stick my neck out and say at least five years. Let’s say 2020 to round things up. And if I’m 50% wrong again, then it’s 2022 (and a half). Please, if anyone knows any different, and I mean knows any different, do tell us, we’re anxious to know. Decisions are waiting on it. The choices are simple: back to where we were in Part 1. Either go with the single-channel approach, that is, a single 4K projector or two double-stacked projectors. Or go multi-channel: an array of projectors blended together. If you’re happy with the resolution that 4K single-channel offers, then go with IMAX’s laser system for a premium solution. The first system for a flat screen will debut this month, and the first production models will be installed in flat screens in the next six months to 12 months. The first IMAX dome theater is expected about a year after that, still long before any 8K projector. Alternatively, contact any of the other vendors offering 4K projectors, servers, and a custom lens set for the dome. It’s not trivial, but there are a number of very competent AV companies who could design and integrate a solution. Two such systems have been installed, the largest in a 60-foot (18-meter) dome in Sioux Falls, SD. If the resolution of 4K isn’t good enough (and remember that’s 2160 pixels stretching front to back) then you’re going multichannel. But fear not. Those early-adopter experiences that I was describing in Part 1 are behind us. Or should be. And don’t just take my word for it. The GSCA digital dome demo in Richmond last month (see LF Examiner, Oct.-Nov. 2014) demonstrated that multichannel digital can stand confidently alongside film. Point proven. What hasn’t been proved yet is how much effort it takes to maintain that quality. Remember, there is still one significant Achilles Heel in that system. In fact, five: the big, bright, xenon lamps that will change brightness and color as they age. I understand that Evans & Sutherland has developed a color management system to solve that problem, but it hasn’t been fielded yet. When it is, and assuming it works well enough, then the overall solution should be robust enough that regular maintenance and tweaking becomes a thing of the past. The other good news is that E&S’s system isn’t based upon profoundly unique technology. Many of the bits and bobs are available in the market. With the right expertise, any number of vendors will be able to emulate this performance. When they’re good they’re very, very good, but when they’re bad, they’re horrid. They make laser modules. In fact one could say they make the laser modules. To the best of my knowledge, they make the laser modules that anyone with a high powered laser illuminated projector will be using; Barco, Christie and IMAX for example. Oh and did you know that Ushio, who make projector lamps, fully acquired Necsel four years ago? And did you know that Ushio also own Christie? There’s forward thinking for you. Of course there are other laser component manufacturers in the world and it’s quite likely that projector manufacturers will, or may even do now, mix the supply of laser modules. But Necsel are by far the market leader right now, so we have them to thank for what’s coming. Thank you. mere flesh wounds. But we all know. These big lamps are fated. Yes, they’re coming to domes, digitally. They’ve already announced it. A little web research reveals that they’re doing their homework to deliver what should be a very good solution. Patents abound to address the complications of domes. Chromatic aberration (wiki: a type of distortion in which there is a failure of a lens to focus all colors to the same convergence point) is going to be an issue because they’ll be using one lens to fill the screen, or at least a significant portion of it. They’ll need something to address chromatic aberration. According to one patent, anamorphic prisms could be their answer! Good. Also IMAX have talked openly, albeit a little vaguely, about their approach to aligning two overlapping pixels from the two projectors they’ll use to project 3D. It involves creating two different images, derived in real time, from the original source content, so that the two images combined create one better image. Now there are a number of legitimate ways to do this. One plays on the fact that the color resolution of our eyes is far less than our monochrome (black and white) resolution. So one could simply overlay a high resolution monochrome version onto a lower resolution color version. That would deal with the issue of alignment. But their solution is hardly abound with resolution so I expect they’ll need to do something more elaborate than that. And one of their patents describes quite fully such a solution. OK then, alignment should be covered too. What about the concern I’ve highlighted earlier, that their solution, like other single channel ones, will only have 2,160 pixels to distribute from the front edge of the dome screen all the way to the rear (wherever they decide that should be)? Well, buried in another patent lies a description that relates to vignetting, or perhaps even foveation; which in simple terms means that all pixels won’t be alike. In this approach, the optical system spreads the pixels across the screen in a non-uniform manner. There will be smaller ones which will also be brighter, and larger ones which will also be darker. Place the smaller brighter ones at the front, where most people are looking, and the darker bigger ones at the sides and the rear. There, that should help. Not just with resolution, but also with contrast; the less light at the back and sides, the less light gets reflected back onto the central part that we’re all looking at. Will the IMAX system use this foveated approach? It would certainly improve the resolution at the prime viewing area of the image. What’s quite certain for me is that the single channel solutions that don’t have all of this effort and expense lavished on them won’t be able to deliver the level of performance that the IMAX solution will. So will they be good enough to pass muster? Depends who’s judging doesn’t it?! I’ve named them already; these two are, primarily, projector manufacturers who have competed head-to-head for many, many years. Focused on professional, hi-end niche markets they have the horsepower to deliver the performance and the reliability. Barco have decided to go all-in with IMAX; to ride on IMAX’s brand and position to take their technology to the giant screen market. That doesn’t mean that Barco powered solutions won’t be seen in in theaters, they might, from time to time, slip through the corporate net. Christie’s approach is quite different. To be prominent in this market and to support their network of integrators. They’ve been very hands-on thus far, and I expect that will continue; not only is there a business case to support it but there’s the not insignificant matter that Christie used to be the preferred supplier to IMAX and now that deal has gone to their lifelong adversary; now there’s a battle-scar to sharpen the resolve! There are others hovering too. NEC might arrive at this ultra-high brightness battlefield as may others such as Digital Projection, Panasonic, et al. Evans & Sutherland (E&S) have already driven their stakes into the giant dome battleground, with their flagship installation at the Science Museum of Virginia. However, they’re being a little shy about offering a laser solution. I overheard a conversation on a bus at a recent conference that explained that their reluctance to promote laser was because of their torrid experience with their own laser development a few years ago which never really got to market. Their concern, I heard, is that this checkered laser history might tarnish their laser credentials (well, it was more than overhearing, I was talking to the guy, and he was from E&S). I hope that they get past this soon because the two couldn’t be farther apart; an experimental, ground-up laser development using unproven imaging chip technology that scanned laser beams across the dome screen vs installing a laser illuminated version of a projector that’s been on the market for a few years and has shipped in many thousands. It’s not the same and, at least in this giant screen market, the theaters are smart enough to appreciate the difference. Mount up and charge forward I say. vendors in the Planetarium market and a few in the entertainment space; Electrosonic, Skyskan and Zeiss to name just a few. In fact Zeiss ventured into laser projection a few years too early too, I hope they don’t have cold feet also. And the surprising newcomer, Dolby. Possibly. They’ve certainly joined the laser projector battle now, and with a charge. To avoid any doubt whatsoever they’ve called it ‘Dolby Cinema’. But will their laser technology make it into domes? I’d say it’s possible. Why? Well, like many they’re using Christie projectors. So there are plenty of integrators who could handle the installation. I believe they’re using their own laser design but it will almost certainly be from a market leading laser module supplier, like erm, Necsel, for instance. They may even be leveraging off Christie’s laser module assembly. So what’s different? HDR (High Dynamic Range) that’s what. I’m sure we’ll learn more soon but so far there are two strands to follow. The first is Dolby Vision; an end-to-end high dynamic range solution that delivers far higher contrast than we’ve been used to seeing at home and in the cinema. A 1,000 times more, they say. Ooh, that should be nice. Dolby Vision is platform independent in that it can be applied to television as well as cinema. So why not domes? For goodness sake domes could do with a touch more contrast. The second strand is that it appears they’ve developed a contrast enhancing approach that utilizes the benefits of laser. More web research reveals a patent that describes local light modulation on the chip which applies less light onto darker parts of the image and more light onto the brighter parts, frame by frame (that’s in addition to the work that the DLP chip does to modulate the light at a pixel level – refer to part 2). Wouldn’t it be wonderful to see domes with HDR laser illuminated projectors that have been juiced up with even more contrast? Yes please. The 3D glasses, I fear. All of the above use color separation to achieve 3D. The reason being is that this is the most efficient solution for lasers; whereby the glasses are manufactured with optical filters to only pass the red, green and blue light from the corresponding projector (the ‘left-eye’ projector has slightly different frequencies of red, green and blue, than the right eye projector. Note that this description is for a dual projector solution; one projector for each eye. 3D can be delivered with a single projector but that means sharing the light available between both eyes. It’s half as efficient, half as bright. To achieve the same brightness a single projector needs at least twice as much laser power as a dual projector system. And because the laser light is the expensive part of these systems, it’s actually cheaper, and better, to use two projectors; higher frame rates are achievable using two projectors, for instance.) These color separation glasses are complicated to make and very complicated, and costly, to make larger. The field of view of these glasses is typically quite small. I hope this won’t be the case for ‘dome glasses’ because the primary benefit of a dome is its very large field of view. I expect that domes would pay a premium price for glasses with much larger lenses. Can’t we just standardize on one solution? What’s clear from the above is that there will be, in fact there already is, choice. That’s generally good for innovation, competition and price. But when the market is so small that’s not always a good thing. Pricing is almost on a one- off basis. And then there’s the matter of content creation and distribution. Too many formats means that to optimize the quality, each digital film delivery for each theater needs to be individually tailored. That just adds complexity, and cost. I hope we can at least limit the choices to a handful, or even a few fingers, of options with clear standards and specifications that we can all work to. To start to conversation here’s three to consider; single channel 4k, anamorphic, partial dome coverage, like IMAX, ensuring that the specifications drive a sufficient level of quality. This would deliver 4k x 2k resolution; dual channel, fulldome coverage (using four 4k projectors, two for the front, two for the back) which would deliver 4k x 4k resolution. Then, if you really need more resolution, five channel which would deliver just over 6k x 6k resolution. All could be, and should be, available with high frame rate, high dynamic range, and higher color gamut and 3D. And big glasses. The good news is that we already have a platform to discuss, debate and agree these standards. It’s called DIGSS (Digital Immersive Giant Screen Specifications). Version 1.1 was ratified by the GSCA in 2013 and we’re now working on DIGSS 1.2. One goal of 1.2 is to do just what’s being advocated here; agree a few standard giant screen dome configurations that everyone can work to.